Back4Sure 3.7.5 Portable » TopFreeSoft.Net - Best Freeware Software! 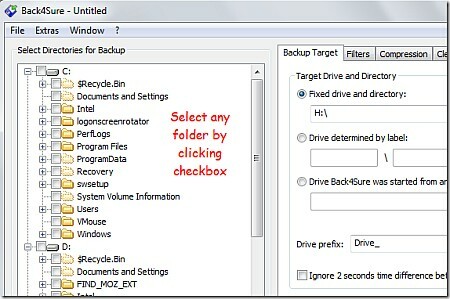 Back4Sure is a simple backup program that allows you to backup all your important files and folders. The program performs incremental backups, so only new or changed files will be copies to the backup location. You can select the folders to be included in the backup with simple check boxes and also choose to include or exclude files based on their extension, age and size. The backups can optionally be stored in compressed format (.zip or .7z). Other features include a cleanup option that will remove obsolete files from your backup set and detailed logging of backup operations. Back4Sure does not come with a built-in scheduling feature but allows you to create shortcuts on the desktop that will automatically run a backup when clicked (or you can used Windows Task Manager to schedule them). You can easily select multiple folders from the directory tree to include them into the backup set. Just as easy you can exclude certain folders from the backup. Back4Sure can handle unicode filenames. They are shown correctly in the directory selection tree and will be copied without errors. Even very large and deeply nested directory structures (path length up to 32000 characters) are no problem for Back4Sure. You can easily create filter set to determine which files to include in or to exclude from the backup. And this not only for the whole backup, but also for individual folders. Backups may be stored in a compressed format. If you choose to enable compression, you can specify the directory depth from which on all files are packed into a single archive file. This way you can avoid very large archives and improve overall safety of you backup process. Compressed backup archives can also be encrypted. If you choose the 7Zip format, even the filenames can be hidden. After larger restructuring of your file organization, lots of files in the backup target directory do not have corresponding source files anymore. Using the cleanup function of Back4Sure you can easily remove those orphaned files from the target directory. All actions performed during backup may be logged into a plain text file. You can choose between two different formats of the log file: either an easy to read version or version in ini format optimized for automated analysis. You can specify actions to execute before and after the backup process, e.g. running programs or scipts or sending a mail with the log file of the just finished backup job. Back4Sure can be instructed to shutdown the computer after all backup tasks have finished. You can easily create a desktop link to a backup job from within the program, from which the backup job can be directly started by just double clicking it. Back4Sure supports some useful command line parameters. This offers the possibility to control Back4Sure via scripts and also allows fully automated execution. Why is this a feature? Well, Back4sure can be fully controlled via command line parameters so you can easily use the built-in task scheduler from Windows. Thus you save another unnecessary background service.